It’s around 7 in the morning when your home is filled with the sweet aroma of tea, amidst which you enjoy small sips of it, while you are still under your blanket, and then your phone rings. It’s not your alarm, but it’s a call from one of those close friends who would never let you stay alone (unless either of you are with your girlfriends). “Oi K kaam cha aaju?” is what he asks, and to which you reply that you are free as always, unless of course your mom has to send you “ration thaapnu”. Your mom already aware of the situation starts showing all of her love in a tone that usually sounds more like “nyaang nyaang”. “Vaat khaayera Jaalas” to “belka time ma awlas” – each and every line mugged up in your mind like the class 8 maths formulae. So that’s how a day in the town usually starts. And the parents have at least in the meantime equipped themselves with expressions like “vatua kukur ko kaam pani hudaina, fursat pani hudaina” to give a beautiful ending to the day. So you leave for the town, “chittikai vayera”. We must be the luckiest group of people on the earth having the privilege to enjoy the sight of the toy train flaunting its beauty on our regular way, without putting in any extra effort. The sun pouring down on the beautiful white mountains is just a thing you get to see only with a flick of your head “bazaar jaada jaadai”. So, with all the sights of the toy train, the majestic mountains, beautiful people and a lot of tourists, you finally reach the town. There you stand “unique ko agari” trying to walk ahead among the traffic of people moving both ways, also keeping yourself safe from the vehicles which run themselves through every inch of space they get. There you see people standing before the Kalyan Medical, doing nothing but watching people and vehicles move. These people that you see doing nothing are actually holding the heart of the town together. Then you reach the iconic “Bata Agari” where half of the Darjeeling population is waiting for the other half. Just then you feel like having a cup of tea and then you have a bipartite discussion with your friend about choosing between Narayan Das and 8 number. Now that you are done with the tea, you slowly start walking “Bata Ukkalo”, greeting and shaking hands with all the friends that you meet after every 10 steps. It’s really a very small town indeed with the biggest of the hearts. As you walk towards Orient, u get to hear the rhythmic chants of “laanuhos 100 ruppey, 100 ruppey, 100 ruppey” – the JB of course. Now as you reach Orient, you walk straight instead of walking through the “Orient ko Ukkalo” – because thats what people without any work in the town do, choose the longer route. Eventually, you reach Inox where you always see a good number of people – some have come to shop inside the mall, a few are there to watch a movie, more than a few hanging around without any work just like you, and a large part of the people are there just to have a pee in the mall’s washroom. Soon you arrive near the Keventer’s via SBI (the bank whose ATM is more crowded than the bich gully), where you meet a friend again, whom you had met just while ago near Bata and you don’t know what to say. Chances remain that you meet him 4 or 5 times more through the day. You already start feeling the warmth of Chowrasta, a whimsical place that draws every soul towards it. Sometimes you have this friend who never stops looking at girls and praising their beauty – “U tya her na, Kya ramri raicha hai” and all such similar lines, and you can do nothing but pray that he stops irritating you. The nothing to do business takes you around the mall road, through the stalls below Mahakal Mandir and with a short period of rest at the back side, having “Aunty ko Gulyo” tea. All through the mall road, you have that “Yes Som”, “Yes Maams” and “Yes Paat” expressions running as you keep bumping on to your new and old friends along your route. You then reach Governors House, where you see couples walking down towards Shrubbery or the Mall road. Meanwhile, the lunch break at Southfield College starts and the students make the scenario more pleasant there. You finally reach Chowrasta again and you find a place to sit beside Bhaanu Bhakta and have a good time looking at the day spending itself in this gorgeous place. As they say, it is a place where if you spend an hour, you fall in love more than once (Ladies, please take pride reading this line). Beautiful is the place, but just a little bit less than the girls walking around, defining fashion and trend in every possible way. It’s already afternoon now and you start feeling a bit hungry, intense bout of internal churning follow, if it’s going to be aalu, momo, thukpa or Benis ko Chola Batura. There you fill yourself with enough food to keep yourself going till the evening. And if the day feels good, and provided you have enough cash with you, you go somewhere else as well. After you are done with all the business, you ask your friend if you should move home now – “Ek bajaar niskera laagdinu parcha hola hai aabo?” Your other friend calls you and tells you that he is in the town as well and that he is waiting near old super market. You meet him, ask him if you are still smelling of booze and then you all start head towards home together. The drivers of the vehicles passing by are like “Silgadi Silgadi….. Bhai silgadi ho?” They do not hesitate asking you even if you are a student in your uniform, returning home from school. Talking about school, its already time when the classes get over for most of the schools and the town gets filled with waves of colours of different uniforms. 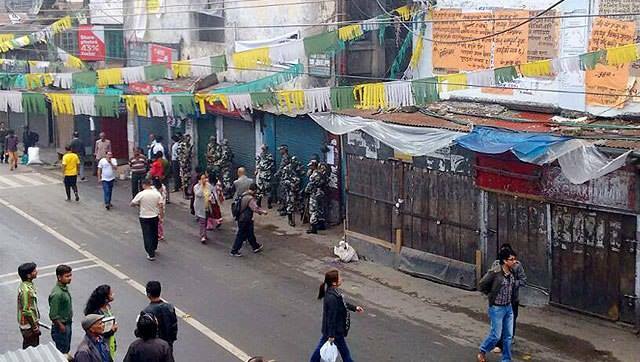 Back in Chowk Bazar, and we do what every Darjeeliney does, check out the latest reason for outrage in town – Posters of various parties and organizations, outraging over this and that. Gives you more fodder for gossips, speculations and opinions. Debating all the way, You now reach Station, where you meet a “gaw ko aunty” who hands you a heavy bag saying “Naani na risai kina ghar purai dew na la. Saarai vaari bhayo samaan”. You finally reach the Golai where you bid you friends goodbye and slowly walk towards your home “fresh vayera”. A beautiful day yet comes to an end and you never get tired of living the same way. My lovely town and its people, no matter what happens in rest of the world, this is how a typical day begins and ends for most of us Bekaris… but no one is complaining, perhaps this is what Gods do every day in Heaven too. Be the first to comment on "The Infinite Pleasures Of Daily Darjeeling Routine"